What It’s About: Two young British women with great football talent struggle to win games while confronting their families’ assumptions about girls and sports. It’s tough enough for Jules (Keira Knightley), whose father is supportive while her mum wants her to wear girly clothing and obsess about boys. But for Jess (Parminder Nagra), a David Beckham fan whose parents are Punjabi Sikh immigrants, there are the pressures of family duty, early marriage and academic expectations. Jonathan Rhys Meyers (most recently Henry VIII on The Tudors and Dracula on, well, Dracula) gives a charming performance as the girls’ frustrated coach. There are a ton of humorous side plots involving teenage drama and culture clash, and a lively mish-mash of a soundtrack (Spice Girls solo projects, Bally Sagoo…), together providing a zany party atmosphere. Won an ESPY award for “Best Sports Movie” and a GLAAD award for “Outstanding Film,” as well as a variety of other international awards, and nominations for a Golden Globe and a BAFTA. Why Watch it Today? : I seem to have a soft spot for Anglo-Bollywood: movies made in the UK or US about South Asian teens (another fun example: Where’s the Party Yaar, with Kal Penn). 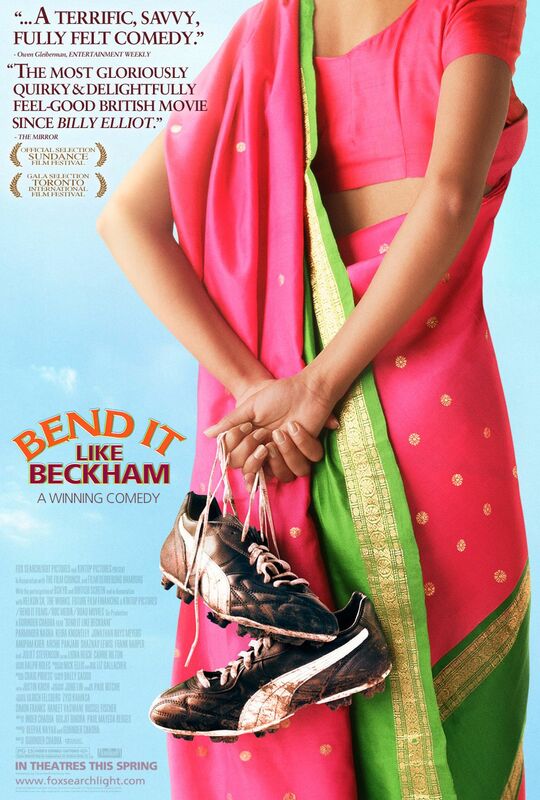 Today’s offering for World Cup Week is a light-hearted comedy about the beautiful game, but arising from a serious intent to show how minorities such as women and immigrants can use it to bridge cultural differences. The film’s female director and writer threw in comedic subplots endorsing tolerance for gays, lesbians, quirky elders, well just about everybody, so if you’re tired of how the (men’s) World Cup ignores women’s contributions to world soccer (or the silly anti-racism banners that probably do less than nothing to change the hearts of chauvinistic hooligans) this could make a nice change of pace. Enjoy. This entry was posted in Buddy Flick, Comedy, Coming of Age, Movie of the Day, Romance, Sports, Women's Picture and tagged coach, David Beckham, Drama, Espy award, football, GLAAD award, high school, immigrants, out of touch parents, Sikhs, soccer, soldiers, Spice Girls, teens, women's sports, World Cup Week.